Directions: Put the radish and apple chunks in a bowl. Drizzle and toss in the lime and olive oil. Sprinkle generously with salt and toss in the cilantro. Serve. Directions: Preheat oven to 400 degrees. Wrap the beets in aluminum foil and place them on a sheet pan. Roast them for 50 minutes to 1 hour, depending on their size, until a small sharp knife inserted in the middle indicates that they are tender. Unwrap beets and set aside for 10 minutes, until cool enough to handle. Peel the beets with a small, sharp knife. While the beets are roasting, whisk together the vinegar, olive oil, mustard, 2 teaspoons salt, and 1 teaspoon pepper and set aside. While the beets are still warm, cut each one in half and then each half into 4 to 6 wedges and place them in a large mixing bowl. As you’re cutting the beets, toss them with half of the vinaigrette (warm beets absorb more vinaigrette), 1 teaspoon salt, and 1/4 teaspoon pepper. Taste for seasonings. 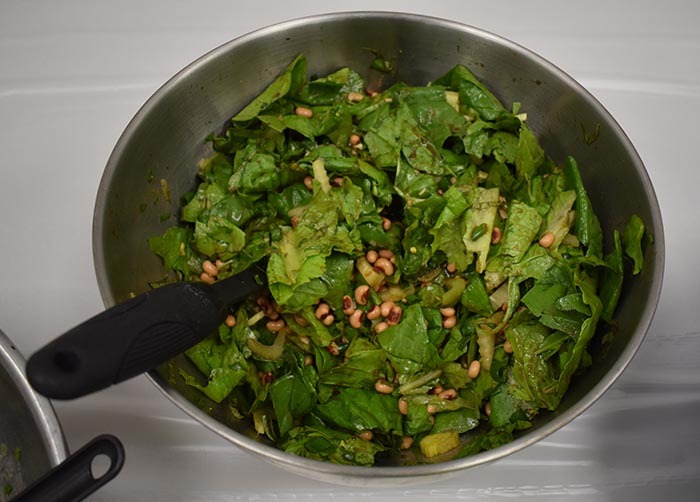 Place the arugula or spinach in a separate bowl and toss it with enough vinaigrette to moisten. Put the greens on a serving platter and then arrange the beets, walnuts, and feta cheese on top. Drizzle with additional vinaigrette, if desired, sprinkle with salt, pepper and parsley and serve warm or at room temperature. Directions: Heat oven to 350° F. Spread the nuts on a rimmed baking sheet and toast, tossing once, until golden, 4 to 6 minutes; transfer to a plate. Increase heat to 450° F. On a separate rimmed baking sheet, toss the cauliflower with the cayenne, 2 tablespoons of the oil, ½ teaspoon salt, and ¼ teaspoon black pepper. Roast, tossing once, until golden and tender, 20 to 25 minutes. Meanwhile, whisk together the tahini, lemon juice, the remaining 2 tablespoons of oil, ¾ cup water, and ¼ teaspoon each salt and black pepper in a large bowl (adding more water if necessary, to achieve the consistency of heavy cream). Add the kale, onion, raisins, pine nuts, and cauliflower and toss to combine. Directions: Bring 1 inch of water to a boil in a saucepan fitted with a steamer basket. Have a bowl of ice water by the stove. Steam snow peas until tender-crisp, about 3 minutes. Transfer the peas to the ice water. Drain. Cut peels and white pith from oranges. Working over a bowl, cut the segments from surrounding membranes. Squeeze the peels and membranes over the bowl to extract about 3 tablespoons juice before discarding them. Transfer the segments with a slotted spoon to a small bowl. Whisk oil, vinegar, shallot, sugar and salt into the juice. Return the segments to the bowl along with the snow peas and jícama; toss with the dressing. Directions: Combine all of the ingredients in a small bowl. Taste the salad and make adjustments to your liking. (I sometimes add a little bit more lemon juice and salt). Directions: Preheat oven to 450°. Slice broccoli stems on a diagonal ¼” thick. Transfer to a rimmed baking sheet, toss with oil, and season with salt and pepper. Gather up loose pieces of left-behind florets and finely chop. Roast stems until browned around edges, 15–20 minutes. Add vinegar; toss to coat. Meanwhile, heat a dry medium skillet, preferably cast iron, over medium-high. Add florets. Season with salt and pepper and cook, stirring often, until bright green and lightly charred in spots, about 5 minutes. Reduce heat to low; add peanuts and sugar. Cook, stirring, until nuts are golden brown. Stir in 2 Tbsp. nutritional yeast or parmesan; season again. Serve broccoli stems and florets topped with scallions and more yeast. Directions: Bring a large pot of heavily salted water to a boil over high heat. Working in batches, blanch the Tuscan kale in the rapidly boiling water for 2 minutes. Drain, let cool, and squeeze out excess water with your hands. Coarsely chop and set aside. Heat a large pot or Dutch oven over medium heat for 2 minutes. Pour in ¼ cup oil, and add the rosemary sprig and the chile. Let them sizzle in the oil for about a minute. Turn the heat down to medium-low, and add the sliced onion. Season with salt and freshly ground black pepper. Cook for 2 minutes, stirring often, and stir in the sliced garlic. Continue cooking for another 5 to 7 minutes, stirring often with a wooden spoon, until onion is soft and starting to color. Add the kale and the remaining 2 tablespoons oil, stirring to coat the greens with the oil and onion. Season more salt and pepper and cook the greens slowly over low heat for about 30 minutes, stirring often, until they turn a dark, almost black color and get slightly crispy on the edges. Remove rosemary and chile before serving. Directions: Dice potatoes (smaller dices cook faster) and cook in water with 1 teaspoon of salt until they are soft. Mix the cooked potatoes with the jalapenos and the frozen corn. Coat the bottom of a saute pan (preferably cast-iron) with oil, set to high heat. Add the collards, cook for 2 minutes, then add the potato mix. The collards should burn slightly, which is the key to this dish because it gives it a smoky flavor. The potatoes will also brown due to the high heat. Season with salt and stir for 2 minutes. Scoop the cooked collards mix into warm tortillas, sprinkle with cheese, sour cream and hot sauce. Finish with a squeeze of lime. The key step in making this Indonesian dish is to create a base of flavors by gently sweating the paste of chiles, turmeric, ginger, and garlic before stewing the collard greens in coconut milk. Directions: Combine turmeric, shallots or onion, garlic, chiles, and ginger in a small food processor and purée, adding up to 4 tbsp. water, to form a smooth paste; set aside. Heat oil in a 6-qt. pot over medium-low heat; add reserved paste and cook, stirring often, until very fragrant, 10–12 minutes. Add sugar, salt, and coconut milk; bring to a simmer over medium heat. Add collards; cook, stirring occasionally, until just tender, 40 minutes. Season with salt and pepper and serve warm. Directions: De-stem and chop the kale. An easy way to de-stem greens is by folding them in half lengthwise along the stem with the darker green side down and then pull up the stem until it comes off and you’re left mostly with leaf. An easy way to chop the greens is to stack a few leaves, roll them up into a cigar shape and cut the through the greens cylinder, making strips. Place strips in a large bowl. Pour olive oil on kale strips and sprinkle on salt. Massage the oil and salt into the strips with your hands until all pieces are well coated. Combine the kale strips with the apples, cranberries and almonds. Whisk together the ranch dressing, apple cider vinegar and black pepper. Toss dressing with the kale. Directions: In a medium bowl of ice water, soak the sliced celery and radishes for 10 minutes. Drain and return the vegetables to the bowl and season with salt and pepper. Pour the lemon juice over the vegetables and toss to combine. Let the vegetables stand for 10 minutes to marinate in the juice. Add the oil to the vegetables and toss to coat. Cut each avocado half into 4 wedges and then gently toss with the celery and radishes. Transfer the salad to a platter and sprinkle with the olives and celery leaves before serving. 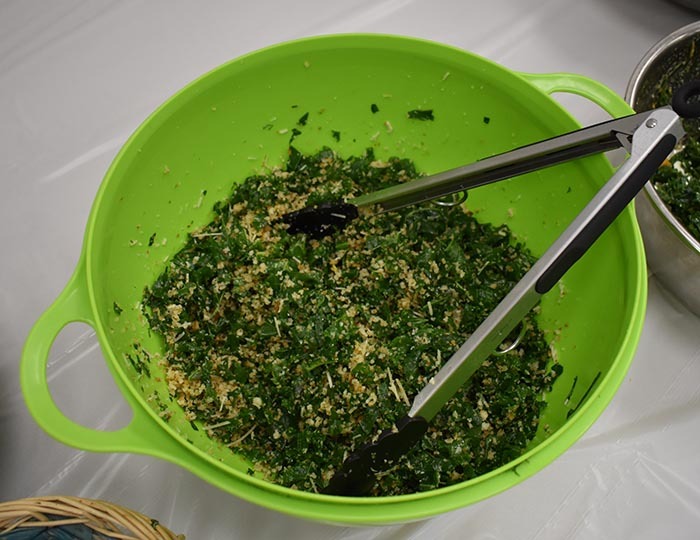 Directions: Make Lemon-Mint Vinaigrette: Place all ingredients except snap peas radishes and nuts in a jar with a tight-fitting lid. Shake to combine. Toss peas with 3 Tbs. Lemon-Mint Vinaigrette. Stir in nuts. Directions: In a large bowl, combine the black-eyed peas, red onion and celery. Pour the dressing over the mixture and gently stir to incorporate, being careful not to break up too many of the beans. Add the spinach and toss to coat. Season with salt and pepper. turnips, apples and brussels sprouts. Serve.